Less than 20% of Alberta's bitumen reserves are close enough to the surface to be mined. Mined oil sands deposits are normally less than 50 meters below the surface but can be as deep as 75 meters below grade. Anything deeper cannot be economically mined since too much waste material needs to be removed before the bitumen-rich oil sands can be accessed. Oil sands deposit are normally located less than 50 meters below the surface. A layer of topsoil, containing trees, shrubs, vegetation and swampland normally covers the deposit. Rock: A layer of rock normally sits below the oil sands, most commonly limestone or granite. Muskeg is a top layer of dead plants in various states of decomposition with a low water table; muskeg is more commonly known as peat bog or peatland. Muskeg is located close to the surface; this layer is very wet and swampy and therefore has very poor soil stability. Due to its soggy consistency, muskeg has limited use as construction material. Once the muskeg is removed, it is typically transported to a waste dump since it cannot be used for building roads or containment dams. Muskeg is typically a few meters deep but can extend much deeper in leases with a low water table. Oil sands leases on the east side of the Athabasca River tend to be more swampy with deeper pockets of muskeg. Properties on the west side of the river tend to be more dry. Overburden is an almost bitumen-free layer consisting of sand, silt, clay and shale that lies on top of the bitumen-rich oil sands deposit, below the muskeg layer. Overburden is sometimes referred to as lean oil sands. Technically, overburden is defined as anything with a low bitumen content that cannot be sent through the process plant. The Alberta Energy Regulator (AER) defines the cut-off grade as 7% bitumen, but the bitumen content of overburden typically much lower. Overburden normally has a high sand content and makes excellent building material. 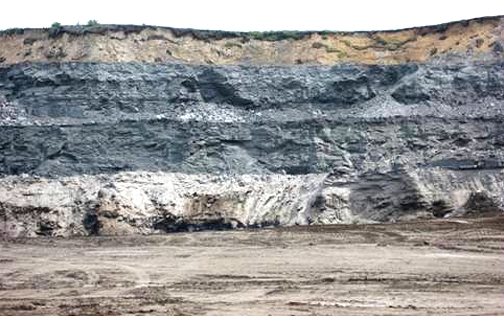 Overburden contains very little bitumen and can be used for lining ponds, construction of roads, tailings dykes and embankments. Oil sands deposits are a loose (or unconsolidated) sand deposit which contains bitumen (a heavy, complex hydrocarbon or petroleum), fine clays and small amount of water. The bitumen content of oil sands normally ranges from 8 to 12% but can be as high as 14%. This oil sands layer is hauled to the processing plant (or Bitumen Production facility), where the bitumen is recovered. The AER requires any section of the deposit containing more than 7% bitumen to be mined and processed through the Bitumen Production facility. Sections of the deposit containing less than 7% bitumen (termed "lean oil sands") are considered part of the overburden layer and can also be used as construction material. However, this is at the discretion of the operator and can be put through the process plant, if desired. AN EXAMPLE OF THE SEDIMENTARY LAYERS OF OVERBURDEN THAT LIE ON TOP OF A TYPICAL OIL SANDS DEPOSIT. Depletion rates in the oil sands are in the order of 4% per year. That means the average mine life in the oil sands typically ranges from 20 to 40 years. That number is astounding considering that conventional wells can deplete as much as 20-40% per year, requiring constant drilling and on-going exploration for new reserves. A long asset life and zero exploration risk are a big part of what make the oil sands such an attractive asset. A typical oil sands lease is comprised of vegetation, muskeg, sand, clays and water in various forms. The top layer is normally covered with trees and shrubs but can also contain wet swamps, peat bog (or muskeg), grassy marsh or fen. Before mining can begin, all vegetation must be cleared from the topsoil. If there are any large trees on the property, the trees are harvested and sold to forestry companies. Once the surface vegetation is removed, any wet muskeg existing on the deposit must also be excavated and hauled away. Muskeg is very wet, soggy and has no soil stability. It therefore cannot be used as building material and is normally transported to a designated waste dump. Depending on the elevation of the water table and topography of the lease, some properties can be very wet. Water can collect at low points during rain events and snow melt. Run-off water is continuously collected and pumped to a water collection pond. Pressurized basal aquifer water will seep up to the surface, destabilizing the ground and posing a hazard to any mining equipment or operators working in the area. Basal aquifer wells are therefore located throughout the mine site, continuously pumping out ground water, keeping the water table low. Dewatering is a critical component of any oil sands mining operation and is on-going throughout the life of the mine. 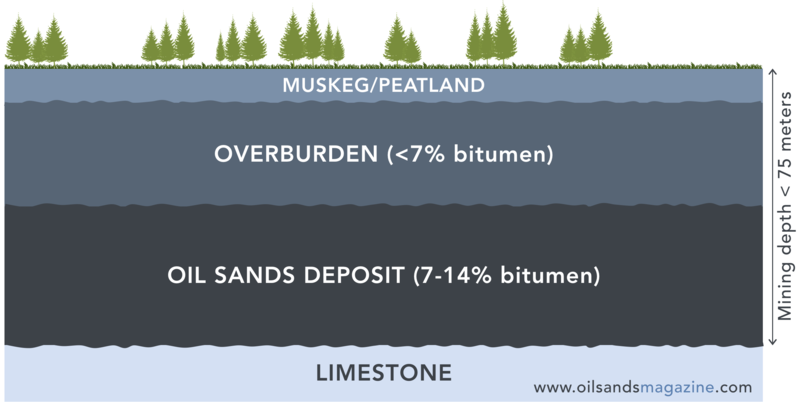 The overburden layer located on top of the oil sands deposit contains sand, shale, silt, clay and a small amount of bitumen. Since overburden is mostly sand, it makes excellent construction material and is often used to build roads, embankments and tailings dykes. Although overburden provides valuable building material, leases with less overburden are more desirable, since less "waste" material needs to be removed in order to access the bitumen-rich oil sands. Having to remove too much overburden can make some sections of the oil sands deposit economically unfeasible to mine. The opening cut is the very first excavation of the oil sands deposit, when the mine face is first exposed. Opening cut material is normally low-quality (or low grade) oil sands. The deposit is excavated using large shovels, which dump the ore onto large haul trucks. The trucks then transport the oil sands to the Bitumen Production processing plant. Since there is very little oil sands exposed at this point, there is limited ore blending ability and little control over the quality of the ore sent to the processing plant. This makes for high variability in feedstock and normally translates to unstable operation of the Bitumen Production facility. It is therefore very common for new oil sands mines to have below average performance for the first few months of operation as the mine opens new faces. Once mining progresses, a typical mine will have several mine faces exposed and several shovels in operation. This allows for ore blending and produces more "normalized" feedstock for the Bitumen Production facility, with less variability in feed quality. For example, one shovel can excavate high grade ore while another shovel is in a lower grade section of the pit. The sequence and sections of mine to be excavated are outlined in the Mine Plan - a plan developed by the geologists and miners which ensures optimal performance of the processing plant, maximum bitumen recovery and minimal hauling distances for the trucks. Mining continues until the pit is depleted or until mining becomes uneconomical (for example, if the remaining oil sands is very low grade or too deep to be mined). Once the pit is mined out, the empty pit is backfilled with bitumen-free tailings, overburden and any waste material that was originally excavated out of the mine. It is important for the backfill material to have good soil stability and a low water content. Once the mine is backfilled, it needs to be reclaimed back to a "natural" state. This normally includes trees, shrubs or wetlands, but the pit could also be capped with water and turned into a pond. Reclamation is deemed complete when the area is capable of sustaining wildlife or vegetation. A typical oil sands deposit is highly variable. It normally ranges from very low quality sections (containing lots of clays and little bitumen) to very high quality seams (with high bitumen grades and very coarse sand). Both low quality and high quality ores pose challenges to the processing plant. Optimal plant performance occurs somewhere in the middle - ores with a good fraction of bitumen, little clays and low sand coarseness. In order to achieve this optimal performance, mine operators must blend these different pockets. This technique is called ore blending and is a very critical component of the Mine Plan. 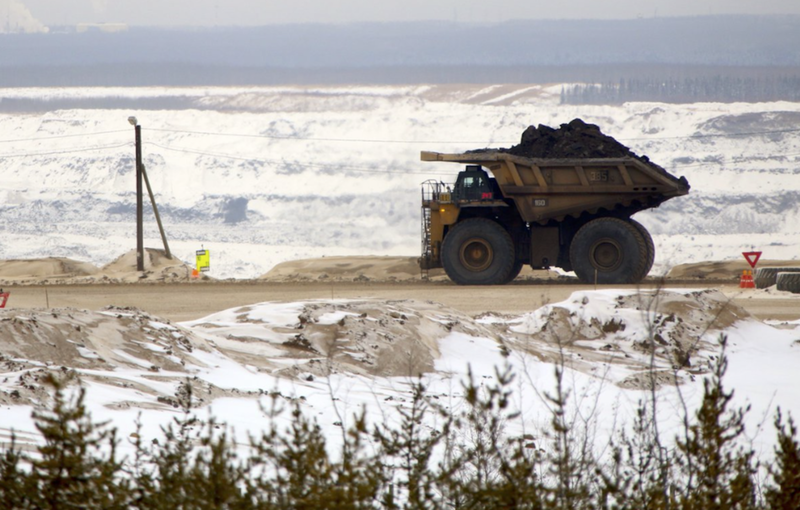 Oil sands mining fleets are subjected to some of the harshest conditions on earth. Equipment must be able to sustain brutally cold winters, abrasive silica sand, sticky bitumen and unstable ground conditions. Although the very first commercial oil sands mining operations used technology borrowed from the coal mining industry, operators have long since evolved to truck and shovel mining, which is much more efficient and cost effective. In order for mining to be economically feasible, the ratio of waste material (or overburden) to oil sands ore must be relatively low. As the oil sands deposit gets deeper below grade, more and more overburden must be removed before the bitumen-rich oil sands can be accessed. Oil sands mining is only economically viable at depths of less than 75 meters below grade. The strip ratio (SR) is the simplest measure of mining efficiency. Strip ratio is the fraction of overburden (or waste ore) versus the weight of bitumen-rich oil sands. A strip ratio of 2 is considered high but feasible if the ore grade is high enough. A better measure of mining economics is the TV:BIP ratio. TV:BIP is defined as the total mining volume (TV) divided by the volume of bitumen contained in the oil sands, or Bitumen in Place (BIP). The Alberta Energy Regulator requires any section of the deposit with a TV:BIP ratio less than 12 to be mined. Anything lower than 12 cannot be wasted or stockpiled. Mining where the TV:BIP is greater than 12 may be economical if the grade is high enough but remains at the discretion of the mine operator. Once the mined oil sands is hauled to the process plant, the large clumps of ore are broken down and then mixed with a large volume of hot/warm water, producing a pumpable slurry. This first step in the oil sands process plant is known as the Ore Preparation Plant (OPP).